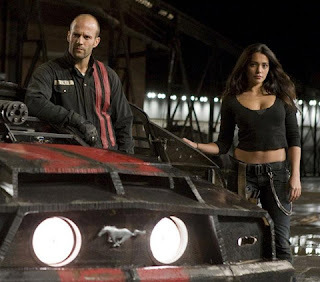 Cam's Cinematic Episodes: Film Review - DEATH RACE: Carmageddon Never Looked Lovelier! 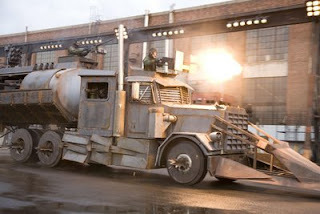 Film Review - DEATH RACE: Carmageddon Never Looked Lovelier! Well, here we are again: sifting through the pathetic remains of summer movie season in search of something (Anything!) to take our minds off the impending return to academic anguish. 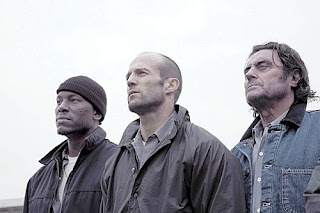 If there is one constant trend that refuses to die, it is that every late August will bring with it another half-assed Jason Statham action extravaganza. Actually, maybe extravaganza sounds too grandiose... How about action distraction? Yeah, that’s probably more appropriate, considering that the last two summers foisted Crank and War onto the unsuspecting populace. 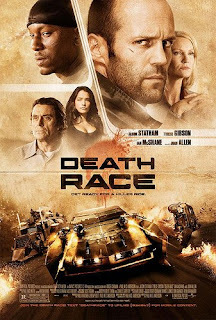 Well, the balding Brit is back in a big way with Death Race, a fun quasi-remake of the cult hit Death Race 2000, helmed by prolific B-movie hack Paul W.S. Anderson (Mortal Kombat, AVP: Aliens Vs. Predator). Set in 2012, the United States of America is undergoing a severe economic depression. While unemployment has reached staggering heights, prison populations have also s welled. To combat the problem, the penal system has been handed over to large corporate entities that have begun staging violent gladiatorial-style reality shows as a means to entertain and inspire the dejected populace. The most popular of these programs is “Death Race”, an all-out vehicular slaughterfest, which is held at the brutal Terminal Island penitentiary. I knew going in to Death Race that I was walking into a sensory assault of concussive idiocy, and sweet Suicide Sally that’s exactly what I got! There’s not a single moment in Death Race that isn’t gloriously over-th e-top. Bodies explode, cars are flattened like pancakes and Jason Statham grimaces, sweats and swears. Anderson has crafted an entertaining throwback to the 80’s tough-guy flicks, where overkill, obscenity and unintentional homo-eroticism were measured out in equal portions and injected into cookie-cutter storylines with larger-than-life personalities. To put it succinctly, Death Race speeds well past stupid and somehow ends up all the way back at awesome. Jason Statham, for once, deserves kudos. I’ve been pretty hard on the guy in the past. With his battery acid-scorched voice an d rugged masculinity, he has the potential to ascend to the pantheon of Action-Gods alongside such names as Stallone, Schwarzenegger, Norris and Seagal. However, instead he’s wasted his gifts in lazy garbage like the Transporter flicks and In The Name Of The King. Fortunately, in Death Race, he has finally found a role that he can exploit to its full iconic potential. As the main opponent, Tyrese Gibson is a tad underwhelming. He seethes and grimaces, but doesn’t have the level of charisma necessary to make his role work. I’m also not sure why they make a point of mentioning that his character is gay when it never develops into anything. Similarly, Natalie Martinez looks great in her form-fitting wardrobe, but falls far short of being a two-dimensional character. I do, however, have to give my supreme thanks to Joan Allen’s agent, who o bviously dropped the ball, allowing us the delight of seeing her slumming here. She’s pithy and cold, never more entertaining than when she’s quietly uttering grievous threats and ultimatums. Few theatrical moments can compare to witnessing this prestigious talent giving the command to “release the Dreadnought!”. Anderson shoots his chaos with some real chutzpah, giving his endless race scenes a nice propulsive quality. The races are gritty and exciting, and the aforementioned Dreadnought sequence is a vicious crowd-pleaser. It was a good move to utilize pra ctical effects and stunts over CG, as the action actually looks convincing. Death Race is rarely coherent, but it has an infectious dumb spirit which surprised and truly entertained me. I’d recommend it to anyone who ecstatically welcomes a Van Damme marathon, and in the oeuvre of Anderson I’d place it above Resident Evil and Alien Vs. Predator, but below Soldier and Mortal Kombat. Make of that what you will.